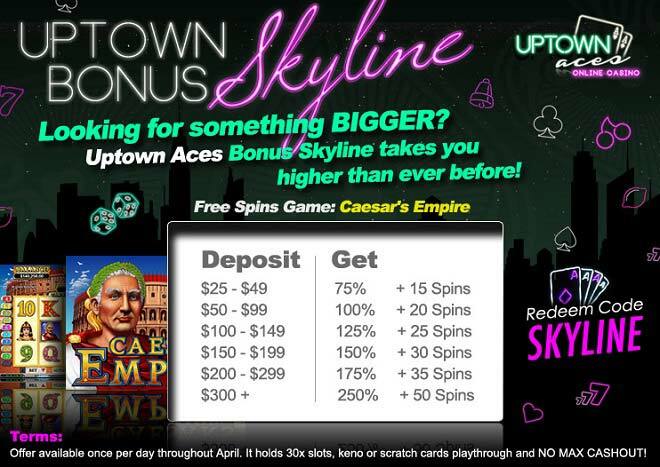 Join Uptown Aces now and receive an $8,888 welcome bonus! 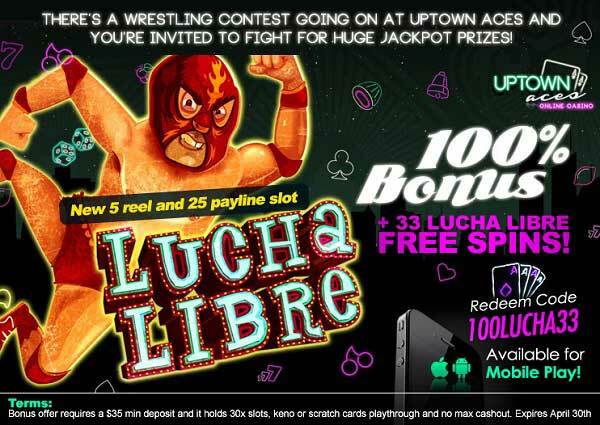 We are passionate about our customer service and promotions here at Uptown Aces, and have decided to offer our latest welcome bonus. You can receive a bonus of up to $8,888 depending on your deposits, and this will be available for all new customers – whether you want to use it on the slot machines or table games! The table below shows just how the promotion works, and how simple it is to earn your bonus cash! Here at Uptown Aces, we are extremely grateful for our custom and encourage our users to win as much money as they like through our games. Through this bonus package, customers can play Slots, Real-Series Video Slots, Keno and Scratch Card games. As previously mentioned, there is NO maximum cash out rule! You really can just continue to play and win as much money as you want, or deposit as much as you want to qualify for the bonuses! Meanwhile, as an added part of the offer, if you use our welcome code UPTOWN1ACES it will trigger 25 extra spins on our extremely popular Enchanted Garden game - with no additional playthrough needed! This offer is available up until April 30th, so sign up before then to take advantage of our fantastic deal. You can also take advantage of this promotion on your computer OR through mobile play! The Easter egg hunt has officially begun at Uptown Aces. Indulge in a couple of special 200% Match Easter Bonuses and your chance to play with a $50 Free Chip on Easter Sunday! Deposit as little as $35 on April 1st and April 2nd you can claim a 200% Match and continue your Easter celebration with another 200% Match on April 3rd and April 4th. The Easter bunny has decided to pay Uptown Aces a special visit this year and it’s up to you to join in the most profitable egg hunt of them all! Redeem both bonuses for your chance to collect a $50 FREE CHIP on Easter Sunday and finish off your week with a bang! Deposit bonus offers require a $35 Minimum deposit and they hold 35x slots or keno playthrough or 70x Black Jack or Video Poker. FREEEASTER holds 40x slots or keno playthrough and $250 max cashout! You must redeem EASTERUPTOWN1 and EASTERUPTOWN2 in order to redeem our Easter $50 Free Chip! New Ghost Ship Slot Game and Exclusive Spins Offers!